I’m trying to keep the blog in a sort of chronological order and because of it takes quite a bit of time I’m roughly a month behind events. But every now and then something so amazing happens sharing it takes precedence over the rest. This weekend was one of them. Some of the Vulcanus interns were visiting their host companies and the rest of us got Friday off. We have read about the Fuji-Q Highlands amusement park and also that the Q stands for 3 hour queues on peak days. A regular Friday therefore seemed like a very good time to visit the park, home of the 4 (former) world record roller coasters. We definitely got our share of both excitement and the Q-ueues (a bit over an hour for each big ride) while enjoying the excellent weather and views of Mt. Fuji. We sadly didn’t manage to visit all 4 of the big coasters, the queue for the last one was inexplicably closed down 3 hours the park’s before closing time. We compensated with other thrilling rides and the Ferris wheel at sunset. In the evening the rest of the thrill-seekers left for Tokyo but I decided to stay in the Fuji Five Lakes area at a hostel to relax in an onsen and to enjoy the hopefully good weather and views the next day. Dodonpa, the current world record holder for fastest acceleration – 0-172km/h in 1.8 seconds! 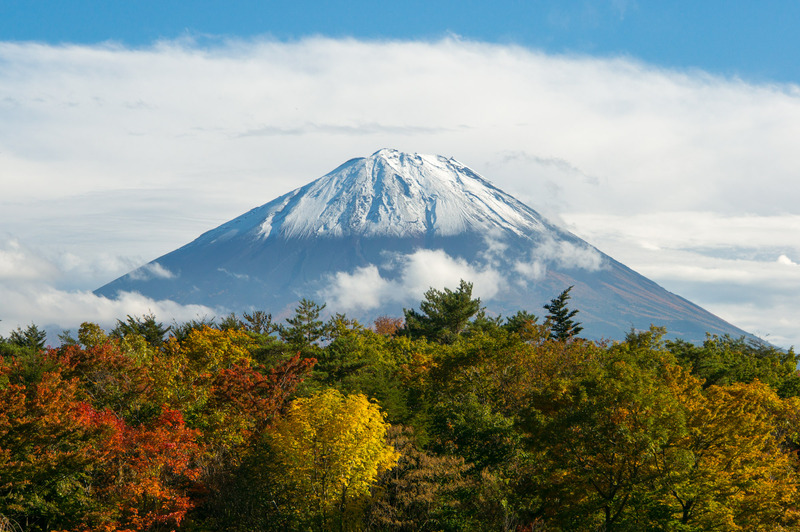 Fuji Five Lakes is an area around the northern base of Fuji, famous for the five volcanic lakes, hills, forests, amusement park and of course Mt. Fuji itself. My hostel was close to the largest of the five lakes – Kawaguchi – so I planned to rent a bike and ride it around for the day. Right from the get go the views had been absolutely spectacular and I was stopping very often to admire the scenery and to snap some photos here and there. I planned on riding the bike to the neighbouring lake Sai but had to abandon the plan after realising the mamachari bike besides being small and heavy isn’t really made for going up a proper hill. Instead I continued around Kawaguchi and ended up taking a gondola lift up to Kachi Kachi Mountain (named after a tanuki and rabbit folk tale). Exhausted I realised it’s going to be easier to take the bus, so I boarded one and headed around Lake Sai to the infamous Aokigahara forest. Aokigahara, also a Sea of trees (Jukai), is more known as the Suicide forest to the western world. It grew on the remains of Fujisan’s eruptions, is very large, flat, and almost impassable. I arrived at the Wind Cave, which is more or less right in the heart of the forest, took a look at the quite unimpressive cave then wandered around a bit for the remainder of the hour until the next bus arrived. My first impression, while still near lots of tourists, was that the forest is beautiful. It had the same fall colours I’ve been enjoying for most of the day. It wasn’t until about 10 minutes in along a public trail through the forest that I realised a very strange uneasiness. It was very quiet, it was slowly getting darker, and it did seem that on every side of the trail there were vast amounts of unwalkable terrain. I also had no signal on my mobile phone but the GPS was still working. Maybe the eeriness came from looking into it all before coming (typing the name of the forest into youtube will result in documentaries that are not for the squeamish) and wouldn’t feel as strange if the infamy of the forest hadn’t preceded it. I went back along the path and got on the bus to leave the forest behind, having seen just enough. My final destination was the Fuji Sengen shrine, a shrine to the mountain itself. I got to it just as it was getting dark and I was seeing the last of Fuji for the day. After that it was back to Fuji-Q Highlands where the bus to Tokyo was picking me up. I was absolutely exhausted at the end of the day but also couldn’t stop smiling, it had been incredible. The title is a reference to Thirty-six Views of Mount Fuji, a famous series of woodblock prints by Hokusai. The artistic value of the series and my photos is of course incomparable, but I still feel like I have had more than a privilege to get a day with Fujisan in all its glory. Next time I see it this close will hopefully be on the way to the summit!